Current Rohtang Pass Status 2019 is Closed. Like previous years, this will remain to be a dedicated post where I will continue update the status of Rohtang Pass; estimated opening date and condition of the road between Manali and the mighty pass. Along with the blog post, I will also continue to update the Forum Post which I will request you to check. Rohtang Pass is expected to open in May 1st week. Snow clearing operation came to a stand still due to snowfall last week but was resumed again yesterday. As I updated earlier, the news about Rohtang and the Manali Leh route getting opened by April 2nd week was not correct. It is April 7th already and the snow clearing work hasn’t even reached halfway to Rohtang Pass. As of now, the pass is not expected to open any sooner than May 1st week. Locals, however, will start to cross Rohtang Pass on foot soon and rescue posts have been set up at Marhi and Kokhsar. Meanwhile, in the wake of oncoming elections, Election Commission of India has requested BRO to allow them to use the 8.8 kilometers Rohtang tunnel on short terms basis to help facilitate the transportation of men and machinery and election-related material. There were news updates by GreaterKashmir and TribueIndia last week that BRO was hoping to get the entire Manali Leh route open by April 2nd week. While the chances of that happening are extremely rare, it does bring some hope for people wanting to visit Manali and Rohtang. If the snow clearing work is going to be that rigorous, Rohtang Pass will get opened in next couple of weeks. With that being said, I would still advise against planning to visit before April end. There is snow still even in the lower areas of Solang Valley. At the top of Rohtang, snow is several feet high and it is highly unlikely that BRO will be able to get rid of all of it in next 2 weeks. Even if they do manage this miracle somehow, Rohtang Pass would still be far from safe for tourists to travel. Locals may get allowed to ply early but tourists most likely won’t be allowed before April end or early May. Please see the Forum Thread for more recent updates and pictures. As per the BRO officials, the work to clear snow from Rohtang Top is all set to begin within a week. There is still a warning of snowfall in coming few days but unless the weather turned extreme, team should be able to commence the operation from Gulaba side. 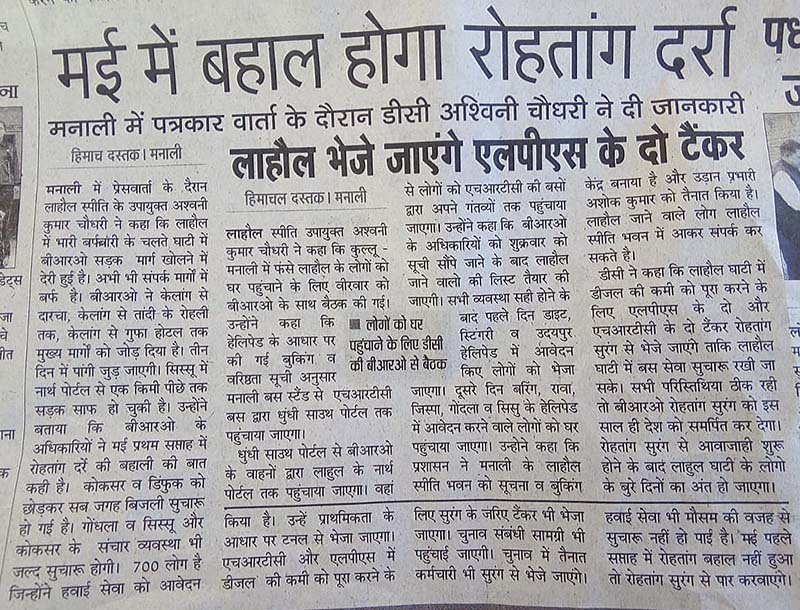 Meanwhile, from Lahaul Valley side, the work will start in a day or two from Satingri towards Tandi and Sissu to connect the road with the Rohtang tunnel in north portal. Similarly, BRO is also in the process of moving machinery and equipment from Udaipur ahead toward Kolang to start clearing the route around Sach Pass. Heavy snowfall continues all across the region and more is expected in coming days. The widespread spells of snow have triggered avalanches in several places, but specially in Lahaul valley on other side of Rohtang. A petrol pump at Tandi and a hot mix plant of a road construction company were destroyed due to avalanches in the valley last week. The recent snowstorm in early May has seen a lot of snow getting accumulated at top of the pass and all along the route. More snow is expected in coming week; and throughout the month of February. For now, do not plan to visit Rohtang before early May. Considering the way the weather is trending this year, the opening of Rohtang Pass may very well get delayed. The entire Himalayan region has experienced tremendous amount of snow this winter and the intensity continues to increase. For now, do not plan a trip to or across Rohtang Pass any sooner than late April. 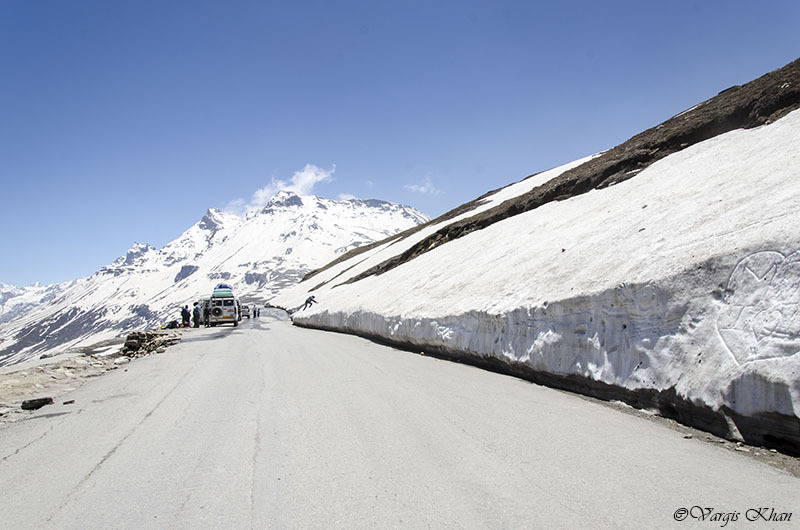 Historically, Rohtang Pass opens sometime in the month of April. It however entirely depends on the weather. There have been times when it was opened in March itself because of very less snow. And sometimes the pass was not opened until early May because it continued to snow at the top. Keeping the trend in mind though, Mid-April is a safe time to assume as the opening time for Rohtang Pass. Is Rohtang Pass Open Today? Yes Rohtang Pass is open today but it is only a matter of days before it gets closed out. Manali has already experienced its first snow of the season near Gulaba check post. I just shared a few recent images of Manali at the Community Post. The weather this year has definitely surprised everyone. The winter of 2017 – 18 saw very less snow across the entire Himalayan region. Even passes like Rohtang did not receive half of the snow they usually do. However, the trend this year is entirely different. Winter seems to have arrived early and caught everyone off guard. An early and heavy snowfall in September saw tourists getting stuck across the valleys of Lahaul and Spiti and at Rohtang Pass as well. The weather closed in suddenly and it turned so bad that people had to be rescued and airlifted to safety. The same trend still continues. It has been raining in Manali all day for last 2 days and Rohtang Pass has already received quite a bit of snow. If the weather remains the same way, snow may even reach Manali in next couple of days; which would again mean an early snowfall in the town. The pass hence has been closed for all kind of traffic and even motorcycles are no longer being allowed. It is highly unlikely that it will again be opened this year but even if it does, I will not recommend traveling anymore. I hope the information above was of help. Keep to check back at the Forum Thread for latest updates on Rohtang Pass. If you have any questions, or need any further details; please feel free to ask in the comments section below; or at our Community Forum; and I will be glad to answer. Any updates regarding Rohatang pass opening date ?? When rohtang will be.opened…in 2019????? Any official phone number available? Nothing is confirmed. It all depends on the weather. Is there any chance that rothang pass will be open by 19-20 April 2019? Planning to visit manali on 14th may…rohtang pass will be open or not? N if not then where will I find d snow..
Around what date can I expect rohtang pass to open? Also can I find snow in solang valley around 15th april 2019? Ok. When can we expect Rothang pass will be open? We are a team of 4 members planning to visit manali,rothang and keylong in own car. We are from kerala. Date would be April 10th. Can u confirm that rothan6pass will be opened or not. Thank u so much vargis for all this updates,as accordingly now i m planning for visit arround 5-6th may,so will it be open in 1st week of may?? Or else if it doesn’t then where can i found snow nearby manali if Rohtang pass does not open…. Hi Vargis – Thanks for your contribution to tourists. I am planning to visit Manali in the month of June 2019. Based on current scenario, can we see snow at Rohtang pass or beyond so that we have a feel of snow. We are planing to travel to Manali of April 18st – April 20th 2019. Could you please let me know with the weather situation that time and i am carrying my elderly father with me. Is he can manage the weather ? Do we need thick woolens etc ?? Weather will be pleasant. Carry a few light woolens and that should suffice. 20 April me rohtang pass khul jayega ? Is June 1st week will be fine to visit leh via rohtang? Is it will be open by that time..
Can you please tell me process of permit of bike for rohtang..
Hi Rohit, Yes the pass will be open by June 1st week. For permits, please take a look at the post below. Open – Yes it will be. hi we are planning to spiti vally whole route. Is kunzum pass and chandratal lake are open on 10 th june. we are starting from shimla on 1 st june. But sir some tour operator said kunzum pass open after 20 th June so we are confused. It is not possible to extend tour date. Hello Mr. Trinadh – Please see this post for details. Your blog has been very helpful in letting me know the various options for a trip to Leh Ladakh I have planned for in May. We want to go May 1st week, what are the odds that the pass will be open by then ? I know that it is subject to weather, but what are the odds still ? Manali Leh route will definitely not open by May 1st week Shakti. Oh ok, many thanks for that ! Guess will have to take the aerial route now. We are planning to visit Manali post 18th May 2019 . Our main motive is to visit Rohatang. Would it be opened at that time? We also want to know alternative snow point at that time. Yes it should be open. There is no alternative snow point in May. When does the rohtang pass open this year? It depends on the weather entirely. We are planning to go in the first week of May this year.. will it be open?? Plz let me know.. Depends on the weather but chances are that yes, it will be open. We are going 1st week of April is rohtang pass will open that time? hello, i will visit manali in april. i will be there from 18th april to 21st april. will rohtang pass be open then? please let me know. if not opened then how far can we go? It all depends on the weather but chances are that it may be open by then. If not then you will only be able to go as far as Gulaba check post. We are planing to travel to Rohtang pass in the month of April in between the dates of April 21st – April 26th. Could you please let me know with the present weather situation,whether the pass will be open ? It is usually open by then but hard to predict. There is a lot of snow this year so there could be a delay. Yes it will be open by May. Vargis bhai, thanks for the update,. I plan to visit Rohtag around 10th May-19. Pl. update me whenever it opens. While I will follow your post here, it would be great if you SMS me on +919769689890. Thanks. Poonam here. Can you just help me out whether it would be safe to visit Spiti from Manali via Rohtang on 26th May 2019? Will Rohtang be declared open by that time? Your response would be awaited. Hi, Am visiting Manali this Friday its on 11th Jan .. so i will not be able to visit Rohtang Pass?? Where else i can see snow fall. please let me know which is the best place to visit during this time.. It usually opens sometime in April but hard to predict an exact date. Book a ticket for sometime around April end to be on a safer side. 5may2019 rohtang pass is open??? Depends on the weather but usually it is open by that time. First snwofall of the season at Manali near Gulaba. Just shared a few recent images here.